#MarchMadness is coming to town! Did you know? When Columbia hosted the East Region of the NCAA Tournament back in 1970 (the last time the tournament has come to Columbia), it hosted seven teams: Davidson, Niagara, NC State, Penn State, St. Bonaventure, Temple, and Villanova. The winner of the East Region that year was St. Bonaventure, and the overall tournament winner was UCLA. Today’s basketball powerhouses—Duke, UNC, Gonzaga, Virginia, Kansas, etc—weren’t even in the tournament! A lot has changed in the last 49 years, and we’re excited to help welcome the tournament back to Columbia. This year, eight college basketball teams will come to Columbia for Round 1 and Round 2 of the NCAA Tournament. The teams will be selected on Selection Sunday (March 17) and will begin arriving in Columbia on Wednesday in preparation for Open Practice on Thursday. Round 1 will take place on Friday, March 22 with the eight teams facing off in four games. The winners of each game will advance to Round 2, which will be held on Sunday, March 23. These winners will take the court against one another and the two winning teams will move on to the Sweet Sixteen. We know we’re excited to see all of the college basketball teams, fans, festivities, and more come to Columbia this year. Are you planning to get out around town and experience the fun for yourself? 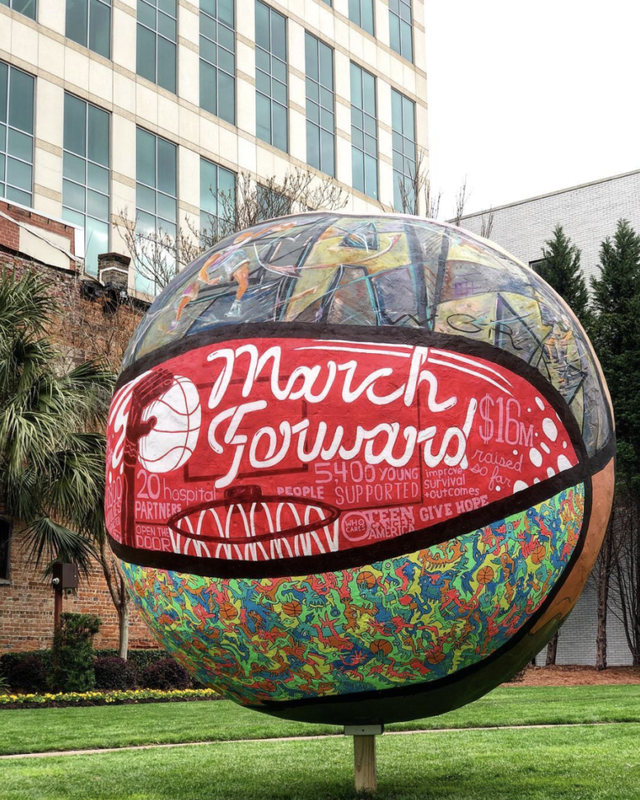 Even if you don’t have tickets to a game, you can still enjoy March Madness in Columbia. 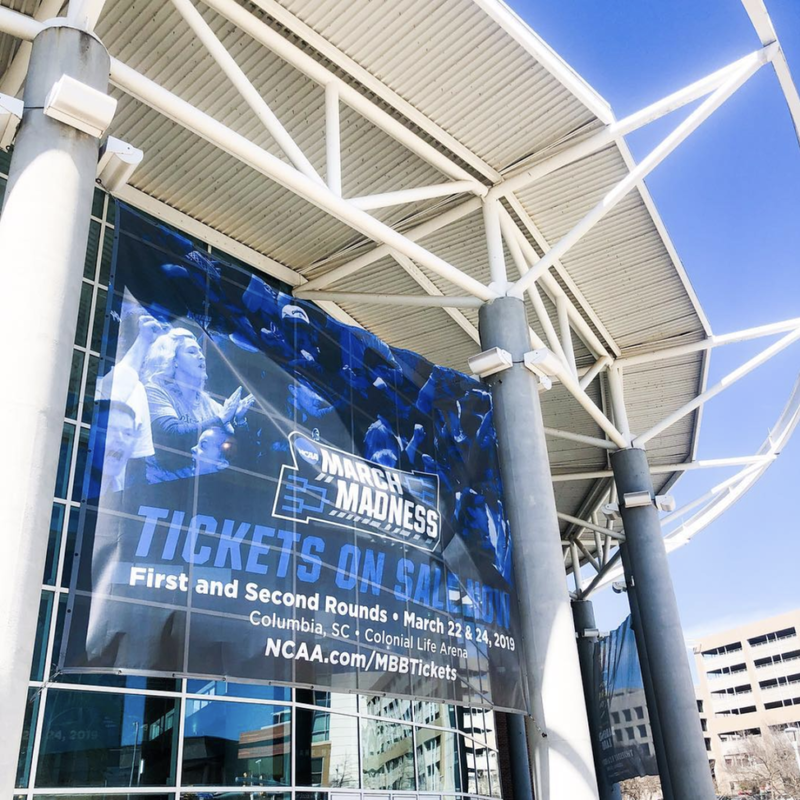 We wouldn’t say this is a once in a lifetime kind of event… but it has been nearly fifty years since March Madness was in town! Fingers crossed that it comes back to town again soon, but just in case it doesn’t, you’ll want to make the most of the activities, festivals, and more that are happening this weekend. Each team has a 40 minute practice session at Colonial Life Arena on Thursday. Be sure to check the schedule to see which teams are practicing when so you can catch your favorite teams. If you’re hoping to see some basketball but don’t have tickets to any of the games, this is your chance! Admission for Open Practice is first come, first served. With no basketball happening in town on Saturday, spend your day off the courts on Main Street! Soda City Market will be hoppin’ from 9am until 1pm like usual, but will feature special appearances by the Gamecock cheerleaders, Cocky, and the Gamecock people band. The party continues all day on Main Street with food & drink specials and the Fort Jackson 282nd Army Band performing along Main Street from 6-8pm. This free, multi-genre music festival will be held in downtown Columbia at the intersection of Gervais Street and Main Street, directly in front of the State House. It will feature pop, hip hop, country, and rock artists! Everyone will be able to find some music at the festival that they enjoy. You’ll also find local food trucks and beverage vendors, basketball themed games and activities, and you won’t have to miss a second of the Saturday games—there will be large video boards around the festival playing games from around the country. Enjoy March Madness, Columbia! It’s going to be a great weekend of college basketball in Columbia!